Technology is available to control temperature, humidity, carbon dioxide (CO2) content, and even nutrient dosing and pH control all through your mobile device. 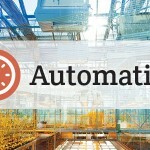 Whether you are new to automation or a tech-savvy, there are options out there for all growers to help reduce the workload and free up some of your time for other aspects of your business or life. In the age of smartphones and ever increasing technology, agriculture is also moving into the 21st century. An ever-increasing number of growers are looking into automating portions or nearly all of their operation. Technology is available to control temperature, humidity, ventilation, and carbon dioxide (CO2) content. There are even nutrient dosing and pH control methods that all work through your mobile device. Whether you are new to automation or tech-savvy, there are options out there for all growers to help reduce the workload and free up some of your time for other aspects of your business or life. In this section of our learn to grow series, we will discuss grow room automation. As you gain experience and your operation increases in size, the next step should be reducing your workload. Automating your growing space requires you to first have a good understanding of the ideal environmental conditions for your plants. So, if you haven't read our grow room atmosphere and ventilation guide yet, start there. This guide will detail how to automate environment of your grow room, but not your grow lights. Your grow lights are so important, and automating their use is not as simple as other aspects of your growing space. You will need to use a lighting controller in conjunction with a light moving system, and meters to test the efficiency of your lights. Thus, we have an separate guide on automating grow lights. This is a very important topic, so we encourage you to take a look at this as well! Now, lets get on with automating your grow room environment. Temperature is important to plants, as it sets the stage for growth and proper development of the plant. Clones and seedlings need higher temperatures, because it allows them to absorb more moisture out of the air through their foliage. At this early stage, they will have little or no root mass. Therefore, they need to take in moisture through the stomata in their leaves. If temperatures are less than ideal, it will increase the risk of mold, mildew, and pests. The ideal temperature will depend on the kind of crops and growth stages being grown. For cannabis, keep clones in an environment of 75-85 degrees Fahrenheit. As these plants begin to veg and harden off, you can slowly decrease the temperature to a low end of 70 degrees. While plants are flowering, decrease this a little more to the range of 68-73 degrees. This will simulate the changing of seasons, and help with flowering. It is important that day and night temperatures do not vary by more than 10 degrees. While grow lights are off, temperatures will inevitable be lower. Using a temperature controller will turn off fans and air conditioners in accordance with grow lights, to maintain optimal conditions. Using a temperature controller in your grow room will ensure your temperature stays in the optimal range. You can set it and forget it. Some temperature controllers even have photocell, which enables them to work on the same cycle as your grow lights. This is important for managing day time/night time temperatures. These controllers will turn off fans, A/C's, and CO2 devices when lights turn off. If you need to cool down your grow room, increase ventilation or add in more circulation fans. Using LED grow lights will provide the same intense light as HID's, without the added heat. If you have a serious heat problem, you will need an air conditioner. There are tons of great grow room A/C's available at Hydrobuilder, and you can learn about them here. If you need to make the room warmer, add heating pads or additional lights, or switch to HID lights that will produce more heat. As a last resort, you can use a space heater or greenhouse heater. These are best used in large grow rooms or greenhouses. For more information on managing heat in your grow room, check out this full guide. Temperature and humidity work together to create the growing conditions for plants. Similar to temperature, each crop and growth stage will have an ideal humidity. During propagation humidity should be higher than normal, up to 70-75%. As plants begin vegging and develop a root system, drop humidity to 40-50% and maintain this during flowering. If humidity levels are too low, the plants may take up too much nutrient solution because they are not able to get moisture through their foliage, leading to nutrient burns. If humidity is too high, excess moisture will contribute to mold and mildew development, and invite pests into your grow room. A humidity controller will work in conjunction with your dehumidifier and/or humidifier. These devices will measure moisture levels in the grow room, and adjust accordingly. If you do not have a humidity controller, you will be stuck constantly stopping by your growing space to read your hygrometer, and adjusting devices accordingly. There are even controllers that can work with temperature and humidity simulanteously! Having a high-quality ventilation system will help keep temperature, humidity, and CO2 levels within the optimal range. Your ventilation system is crucial for creating an ideal environment, and controlling odors. A simple ventilation system will have an inline fan, to exhaust air. A more complex ventilation system will have an intake and exhaust fan, to bring in fresh air while simultaneously expelling old, hot air. 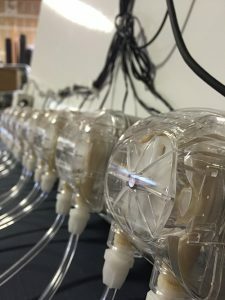 You want to exchange air at least every 3-5 minutes. It goes without saying you will need a timer or controller to achieve this. 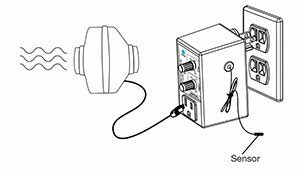 To control your ventilation system, you will use what is called a fan-speed controller. With one of these, you can control the power of your fans, set your ventilation intervals, and turn on/off fans in accordance with your grow lights. 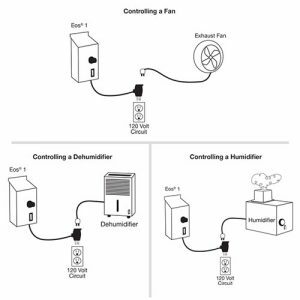 Connect your controller to your inline fan, and set the interval on which you want to recycle air. Many of these contain a temperature sensor, and will adjust use accordingly. Make sure your unit has photocell, so that it will turn on and off with your grow lights. Carbon dioxide (CO2) can be harmful to humans, but incredibly beneficial to our plants! Supplementing your plants with CO2, provided you have ample grow lighting, will show decreased time to harvest and increased yields. CO2 burners are one of the most common methods for supplementing the grow room with CO2. There are also tank and regulator kits, which are equally effective, and sometimes more convenient. Since CO2 is heavier than air, use oscillating fans to evenly distributing the CO2 in your grow room or tent. You can learn more about CO2 here, in our detailed guide on how to use it effectively in your grow room. As plants grow, testing CO2 monthly will help you adjust the system to the optimum levels. CO2 controllers will continually measure the CO2 in the area, and open and close the regulator accordingly. 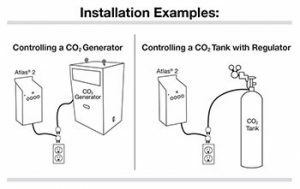 Without a CO2 controller, you will be stuck manually turning on and off equipment. A controller will also help keep the CO2 levels at a safe level! Again, these controllers often contain photocell, to ensure your CO2 devices run at the same time as your grow lights. While grow lights are off, there is no need for CO2. Potentially one of the biggest automation breakthroughs in grow room technology, is the nutrient and pH doser. Autodosers allow you to optimize nutrient levels and maintain pH to achieve maximum yield. Products are available for all operations from a small hobbyist to a large commercial operation. If you are not able to stop by your grow room to feed your plants daily, or plan on taking a vacation, you need an autodoser. These will feed your plants a perfect ppm ratio, with the correct pH, with or without your presence. Autogrow offers a range of products that allows your business to expand and grow. The Minidose has the ease of a singular function of controlling fluctuations in electrical conductivity (EC) and pH. The Autogrow Intellidose is designed for small commercial operations. In addition to the 9-part nutrient dosing with variable ratios, it also allows for day/night automation to allow different EC to optimize nutrient delivery. Additionally, up to four irrigation systems can be controlled. This system is easy to set up and easy to use. The autoset feature automatically tests the pumps and sets dose times. This system will also send you SMS alerts if something is not operating correctly. 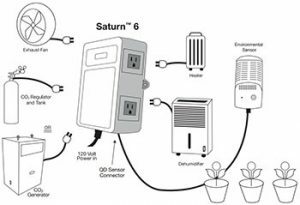 The Multigrow system allows for the delivery of nutrients and control of humidity, temperature, and light all from a large touch screen or can be directly connected to your PC, iPad, or other internet connected device. Up to eight greenhouse compartments and eight tanks for nutrient dosing can be controlled with just one unit. 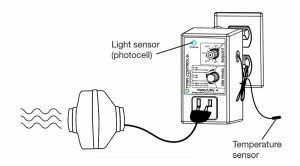 The irrigation controller can be set by timer, time of day, or by solar integrator to measure radiation. As a bonus, each Multigrow purchase comes with a one year subscription to My.Autogrow. My.Autogrow stores all your data in one place for climate, nutrient, and irrigation so you can easily share data with a crop consultant. It also offers the freedom of SMS and email alerts if a system is malfunctioning and allows for settings to be changed remotely. Bluelab also supplies a similar range of autodosers. The Bluelab pH Controller is the simplest, controlling only the pH. The Bluelab Pro Controller integrates automation of pH, nutrient, and temperature. Automatic Temperature Compensation (ATC) allows the pH meter to accurately determine the pH value at any given temperature. This system is compatible with the Bluelab Dosetronic Peridoser kit includes the doser and controller. This system allows for the management of two-part nutrient solution (A and B) and to control pH. Using a separate controller for temperature, humidity, fan-speed, and CO2 can get messy. While automation will improve growing conditions and make your life easier, you don't want to crowd your growing space with equipment and devices. Multi-function grow room controllers were designed with this in mind. You no longer need a controller for each of these, instead, you can use one master controller. A multi-function grow room controller will manage the entire atmosphere and ventilation system of your grow room. When you grow crops indoors, you have created a completely artificial environment where you provide for the basic needs of the plants. In order to achieve maximum yields and quality, everything from the lighting to ventilation to watering system must dovetail 24 hours a day. It can be a complex feat, but with the right grow room controllers can easily be managed by even a novice grower. While there are numerous options out there, we have selected a few master controllers available using today’s technology. Perhaps one of the most advanced wireless environment controllers available is Growlink's. This device will automate every aspect of your grow room, regardless of whether you grow in traditional pots and soil or hydroponics. The Growlink controller is wifi connectable, and will transmit information to your smart phone, logging all data. You can sync temperature and humidity, so they work together to create a stable growing environment. The Titan Hyperion I offers wireless control and gives you the ability to monitor and control temperature, CO2, and humidity during the day and night. A lighting controller includes a high temperature shut-off and 15 minute cool down setting with pre-set and custom lighting schedules. This controller is so helpful, it’ll even tell you when it’s time to change your light bulb. The three year warranty makes the significantly higher price tag easier to accept. For those that like the idea of controlling their grow room from anywhere in the world, iPonic offers several controller options designed for the hobbyist grower to large commercial operation. The iPonic Series developed by Link4 Corporation provides grow room control with platform independent mobile control and alarms. Using cloud technology, the iPonic Cloud connects all your controllers for easy remote management. Data is also stored in the cloud which allows you to go back and review conditions which may have resulted in your bumper yield or various problems. These controllers are more expensive than the Titan or Autopilot controllers, but that may be outweighed by the one year warranty and the ability to improve record keeping by storing historical data. This is the end of our how to grow series, but we will never stop providing fresh, original content for you! Our goal is to continue helping growers cultivate the strongest, healthiest plants possible. By now, you should have a good understanding of how to grow. But if there is anything you are still not sure about, we are just a phone call away. Our expert growers are available to help you at 888-815-9763. If you want to learn more, browse the rest of our learning center for helpful tips and advice on all things growing!